Prof. Roychowdhury's Research and Personal pages | Group Publications page | Class pages. 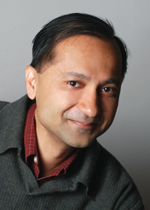 Jaijeet Roychowdhury is a Professor of EECS at the University of California at Berkeley. His research interests include machine learning, novel computational paradigms, and the analysis, simulation, verification and design of cyber-physical, electronic, biological, nanoscale and mixed-domain systems. Contributions his group has made include the concept of self-sustaining oscillators for Ising-based and von Neumann computation, novel machine-learning techniques for dynamical systems, theory and techniques for oscillator phase macromodels, injection locking and phase noise, multi-time partial differential equations, techniques for model reduction of time-varying and nonlinear systems, and open-source infrastructures for reproducible research. Roychowdhury received a Bachelor's degree in electrical engineering from the Indian Institute of Technology, Kanpur, India, in 1987, and a Ph.D. degree in electrical engineering and computer science from UC Berkeley in 1993. From 1993 to 1995, he was with the Computer-Aided Design (CAD) Laboratory, AT&T Bell Laboratories, Allentown, PA. From 1995 to 2000, he was with the Communication Sciences Research Division, Bell Laboratories, Murray Hill, NJ. From 2000 to 2001, he was with CeLight Inc. (an optical networking startup), Silver Spring, MD. From 2001-2008, he was with the Electrical and Computer Engineering Department and the Digital Technology Center at the University of Minnesota in Minneapolis. Roychowdhury was cited for Extraordinary Achievement by Bell Laboratories in 1996. Over the years, he has authored or co-authored seven best or distinguished papers. He has served on technical and administrative committees within several conferences and professional organizations, including ICCAD, DAC, DATE, ASP-DAC and CEDA. Roychowdhury was a co-founder of Berkeley Design Automation, a startup later acquired by Mentor Graphics. He is a Fellow of the IEEE. T. Wang and J. Roychowdhury, "Rigorous Q Factor Formulation and Characterization for Nonlinear Oscillators," arXiv, vol. 1710, no. 02015, Oct. 2017. T. Wang and J. Roychowdhury, "Oscillator-based Ising Machines," arXiv, vol. 1709, no. 08102, Oct. 2017. T. Wang and J. Roychowdhury, " Well-Posed Models of Memristive Devices," arXiv, vol. 1605, no. 04897, May 2016. J. Roychowdhury, "General-Purpose Boolean Computation Using Sub-Harmonic Injection Locking in Self-Sustaining Oscillators," Proceedings of the IEEE, vol. 103, no. 11, pp. 1958-1969, Nov. 2015. T. Wang, K. Aadithya, B. Wu, J. Yao, and J. Roychowdhury, "MAPP: The Berkeley Model and Algorithm Prototyping Platform," in Proc. Custom Integrated Circuits Conference, 2015. J. Roychowdhury, "Boolean Computation Using Self-Sustaining Nonlinear Oscillators," arXiv, vol. 1410, no. 5016, Oct. 2014. T. Wang and J. Roychowdhury, "PHLOGON: PHase-based LOGic using Oscillatory Nanosystems," in Proc. Unconventional Computation and Natural Computation: 13th International Conference, UCNC 2014, London, ON, Canada, July 14-18, 2014, LNCS sublibrary: Theoretical computer science and general issues, Springer, 2014. K. Aadithya, S. Ray, P. Nuzzo, A. Mishchenko, R. K. Brayton, and J. Roychowdhury, "ABCD-NL: Approximating Continuous Non-Linear Dynamical Systems using Purely Boolean Models for Analog/Mixed-Signal Verification," in Proc. IEEE Asia South-Pacific Design Automation Conference, 2014. K. Aadithya, A. Demir, S. Venugopalan, and J. Roychowdhury, "Accurate Prediction of Random Telegraph Noise Effects in SRAMs and DRAMs," IEEE Trans. Computer-Aided Design, Jan. 2013. R. K. Balachandran, J. Roychowdhury, K. Dorfman, and V. Barocas, "Telescopic Time-Scale Bridging for Modeling Dispersion in Rapidly Oscillating Flows," AIChE Journal, July 2012. A. Neogy and J. Roychowdhury, "Analysis and design of sub-harmonically injection locked oscillators," in Proc. IEEE DATE, 2012. D. Amsallem and J. Roychowdhury, "ModSpec: An Open, Flexible Specification Framework for Multi-Domain Device Modelling," in Proc. IEEE ICCAD, 2011. J. Roychowdhury, "Hierarchical Abstraction of Phase Response Curves of Synchronized Systems of Coupled Oscillators," arXiv, June 2011. P. Bhansali and J. Roychowdhury, "Injection Locking Analysis and Simulation of Weakly Coupled Oscillator Networks," in Advanced Simulation and Verification of Electronic and Biological Systems, Springer, 2011. C. Gu and J. Roychowdhury, "Generalized Nonlinear Timing/Phase Macromodeling: Theory, Numerical Methods and Applications," in Proc. IEEE ICCAD, 2010. C. Gu and J. Roychowdhury, "Computing Probabilistic Hypervolumes," in Extreme Statistics in Nanoscale Memory Design (Integrated Circuits and Systems), Springer, 2010. J. Roychowdhury, Numerical Simulation and Modelling of Electronic and Biochemical Systems, Foundations and Trends in Electronic Design Automation, NOW Publishers, 2009. C. Gu and J. Roychowdhury, "Model Reduction via Projection onto Nonlinear Manifolds, with Applications to Analog Circuits and Biochemical Systems," in Proc. IEEE ICCAD, 2008. N. R. Shanbhag, S. Mitra, G. de Veciana, M. Orshansky, R. Marculescu, J. Roychowdhury, D. Jones, and J. M. Rabaey, "The search for alternative computational paradigms," IEEE Design & Test of Computers, vol. 25, no. 4, pp. 334-343, July 2008. S. Srivastava and J. Roychowdhury, "Independent and interdependent latch setup/hold time characterization via Newton-Raphson solution and Euler curve tracking on state-transition equations," IEEE Trans. Computer-Aided Design of Integrated Circuits and Systems, vol. 27, no. 5, pp. 817-830, May 2008.